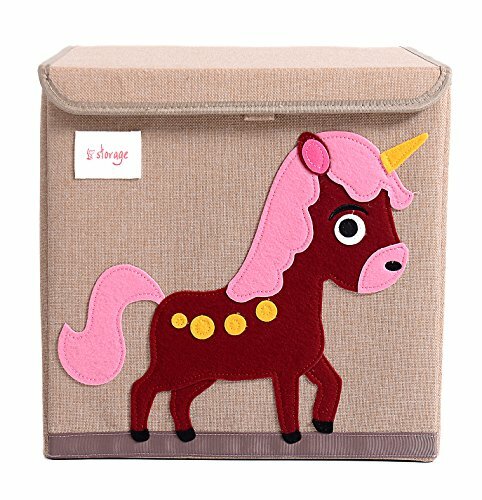 HIYAGON 13''x13''x13''Storage Box/Bin/Cube/Basket/Chest/Organizers with Lids for Bedroom, Nursery, Playroom, Toys, Clothing, Blankets, Books, More(Unicorn) by HIYAGON at Indsight. MPN: 43234-551. Hurry! Limited time offer. Offer valid only while supplies last. This cute and stylish large canvas storage basket is a must-have for your beautiful home! Have an organized, clutter-free play area for you kids. This cute and stylish large canvas storage basket is a must-have for your beautiful home! Have an organized, clutter-free play area for you kids. Your little ones will love to put away their toys, books, and clothing into this decorative storage basket. -Great basket for nurseries, with enough storage space for diapers, baby wipes, diaper rash cream, baby clothes, burp rags, teething toys, and lotion. -Perfect organizer for play rooms, allowing for the storage of toys, books, blocks, stuffed animals, toys with multiple pieces, train sets, or board games. -Chic design allows it to be used in the living room to hold throw blanket, pillows, and reading materials, as well as in the bathroom for towels, or as a laundry hamper. Gets out of your way when you need it to. The canvas is designed to collapse down flat for storage. Why Choose Our Closet Storage Basket? TOY STORAGE CUBE SIZE -- 13 x 13 x 13", Big enough to store cloths, toys, books, puzzles, crafts, or other items. Wonderful nursery bins and room organization for kids, More convenient and saving your space in room. FABRIC STORAGE BOX MATERIAL -- Made of high quality cotton linen fabric safe material, and every side of this toy bin is reinforced with thick board to provide stability and durability. It is wear resistant and very sturdy, can hold pretty heavy things such as multiple packaged of baby wipes, lotions, etc . COME WITH LID -- This children toy organization has lid, keep the dust out. You can use these as standalone storages in a closet, on a shelf, dresser, or under the bed. CUTE DESIGN - Our cube storage bin decorated with a cute cartoon animal applique, kids would love to keep a good habit to store their toys and stuffs. It is not only ornamental but also pratical. EASY TO USE&CARRY-This toy organizer basket is foldable and collapsible, you can collect the folded toy box when not in use. If you have any questions about this product by HIYAGON, contact us by completing and submitting the form below. If you are looking for a specif part number, please include it with your message.